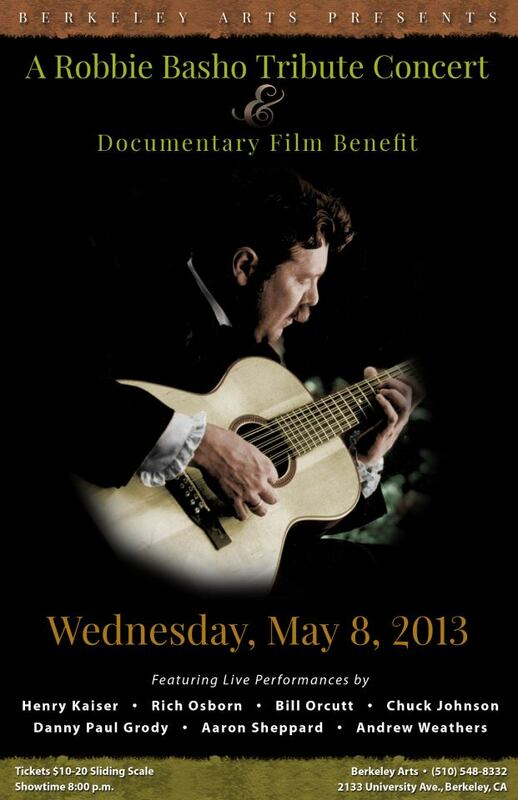 I’ve been meaning to share this video from the Robbie Basho Tribute concert in Berkeley May 8, 2013. Berkeley Arts presented a concert in tribute to the late guitarist and Berkeley resident Robbie Basho. It was a great night of music and an honor to share it with the likes of Chuck Johnson Music, Bill Orcutt,Andrew Weathers, Henry Kaiser, among others. The event was also a benefit to raise funds to complete the first ever documentary film about Basho – Voice of the Eagle: The Enigma of Robbie Basho – currently in the works by London-based filmmaker Liam Barker. Can’t wait to see it when it’s done! Thanks to Omid Zoufonoun for documenting the concert! Hope you enjoy. I’m very honored to be a part of this benefit concert for the (long-overdue) documentary film in the works about the life and music of Robbie Basho. Basho’s work has left an indelible mark on myself, countless other musicians, and music lovers throughout the world. This should be a nice moment to celebrate his legacy as well as raise some funds & awareness for the film. Hope you can be a part of this exciting event! Berkeley Arts presents a concert in tribute to the late guitarist and Berkeley resident Robbie Basho. The event is also a benefit to raise funds to complete the first ever documentary film about Basho – titled Voice Of The Eagle: The Enigma Of Robbie Basho – currently in the works by London-based filmmaker Liam Barker. The lineup includes several Bay Area performers whose work has been inspired in some way by Robbie Basho’s music, including two guitarists who personally knew Basho: fingerstyle guitarist Rich Osborn and renown improvisor Henry Kaiser. We think this will be an historic event, and a fitting tribute to Basho’s legacy – in the same spirit as the John Fahey memorial concerts that took place at the Freight And Salvage in 2002. Robbie Basho (1940 – 1986) was a Berkeley-based composer, guitarist, and vocalist and one of the foremost proponents of steel string acoustic guitar as a solo concert instrument. Along with John Fahey and Leo Kottke, Basho was part of the triumvirate of pioneering guitarists on the Berkeley-based Takoma label in the 1960s. Basho went on to record for Windham Hill, and was an important influence on the label’s founder, guitarist William Ackerman. His innovative guitar compositions incorporated American folk, European, and Eastern influences, and he is credited for developing the improvisational “American raga” style. Voice of the Eagle: The Enigma of Robbie Basho is a journey into the heart of an artist’s lifelong struggle – designed to illuminate and satiate existing fans while serving as a perfect starting point for the uninitiated. Self-funded entirely to date by director Liam Barker, Voice of the Eagle: The Enigma of Robbie Basho features interviews with Basho’s former students, contemporaries and few close friends; interspersed with abstract employment of archive footage and photography of the natural phenomena and localities that informed Basho’s work. Basho claimed to paint America with music; the film will attempt to transfigure Robbie Basho with sound and images. Principal photography began on Voice of the Eagle: The Enigma of Robbie Basho in October 2012, with the filmmakers shooting (and intermittently battling superstorms) in Vermont, Massachusetts, Maryland, Colorado and California. A Kickstarter campaign is set to launch in spring 2013 to enable the film’s continuing production and subsequent post-production costs.